The latest Seasonal offering from Innis & Gunn is an oak aged Espresso Barleywine. Promising to be "a robust oak aged barleywine that has been infused with smooth, roasted coffee beans that deliver a solid caffeine kick. We’ve finished the brew with an infusion of cardamom, mace and cloves, to create a very full-bodied, warming brew, perfect for enjoying by a fire as the colder nights draw in. 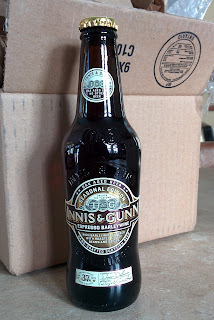 With a rich and distinctly bitter flavour, this is a flavoursome beer that is full of unmistakable Innis & Gunn character." It is sure to warm the cockles of your heart on a cold winters day! While this special release will unfortunately not be available in Ontario, it will be available in Newfoundland, New Brunswick, Manitoba, Saskatchewan, Alberta and British Columbia for a limited time while supplies last. For more details on availability and pricing, please check with your local beer and liquor retailers in the above mentioned provinces.